Fast-growing bamboo is a quick way to grow a living privacy fence. Bamboo's height, dense growth pattern and abundant foliage makes it both an effective privacy fence and one that blends into the landscape better than any wooden or metal fence. Because bamboo grows quickly, you won't have to wait years for it fill in as you would with trees or some shrubs. Bamboo are also evergreen, so you'll benefit from your privacy screen year round. Although many bamboo prefer warm climates, hardy varieties can survive temperatures below 0 degrees Fahrenheit. Buy bamboo plants of a variety with a clumping growth habit. Check that the variety grows high enough to meet your needs. The light and water requirements should also be compatible with your climate. You'll need one plant for each 5-foot section of your planned fence. Buy the plants during late spring or summer, when you can transplant them immediately. Loosen the soil to a depth of 3 feet along a 3-foot-wide row where you want the fence. Most bamboo requires well-drained soil rich in organic material. If you have sandy or clay soil, dig a 3-foot-deep hole for each bamboo plant. Dig the holes 5 feet apart. Set the soil aside and refill each hole about halfway with compost or well rotted manure. Replace some of the removed soil and mix the two layers. Dig a hole 1 or 2 inches deep if you're planting rhizomes with little soil attached. If you're transplanting a potted bamboo with its soil, dig a hole as deep as the pot. Place the bamboo in the hole and fill the hole with soil. Lightly water the plant to settle the soil. Prepare the next planting hole about 5 feet away from the previous. Water the row of bamboo often enough to keep the soil evenly moist until the plants are established. When rain is insufficient to keep the plants from wilting, water to a depth of about 6 inches once a week. Watering deeply, but infrequently helps this grass develop deep roots. Apply nitrogen fertilizer once a month during the growing season. This encourages the bamboo to grow faster, providing a more effective natural privacy fence sooner. If you don't want to fertilize this often, apply the fertilizer once a year in early spring. Prune the bamboo plants to the height you want by removing branches. With a saw, cut the underside of the branch where it joins the culm (stalk). Pull the branch off the culm. This leaves a clean cut. 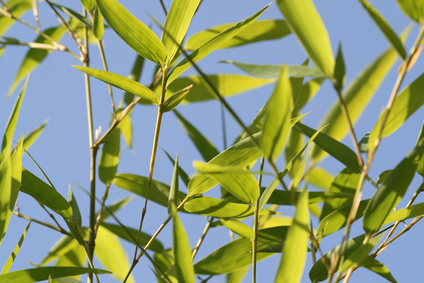 Cut down whole culms as needed to remove damaged plants or control the bamboo's spread. Cut the culms off close to the ground with a saw. Clumping varieties of bamboo grow in clusters and spread more slowly than running varieties, making them easier to grow as a fence.